The 2013 American Silver Eagle Bullion Coins mark a continuation of a series of bullion strikes from the United States Mint dating back to 1986. This series has been struck annually since that year with each being composed of one ounce of .999 fine silver and each containing the same basic obverse and reverse imagery. Other specifications of the series have remained the same as well. This includes a diameter of 40.6 mm and a gross weight of 31.101 grams. As official bullion coins of the United States Mint, each is guaranteed for content, weight and purity by the government of the United States. American Silver Eagles are each struck from one ounce of 99.9% pure silver. Accordingly, the coins have a melt value approximately equal to that ounce of silver and are typically bought and sold based on that melt value. For example, if silver is currently trading for $35 an ounce, bullion Silver Eagles would have a melt value of about $35. 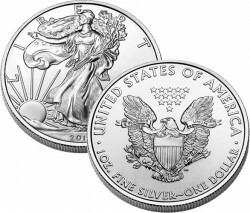 Those looking to purchase a Silver Eagle would expect to pay slightly more than the $35 and those looking to sell should expect to receive slightly less than $35. The difference would be the profit for the person of place where the transaction occurred. The melt value is not the only value associated with the strike. These coins are also considered legal tender of the United States and have a face value of $1. In addition, many collectors also seek out these coins to add to their collection. This is especially true of graded examples which are considered near-perfect (free from scratches, marks, etc.) or those strikes which are considered rare. Coins fitting these descriptions typically sell for premiums over and above any melt or face value associated with them. This is considered their numismatic value. When first issued, bullion Silver Eagles are sold through the Mint’s network of authorized purchasers (APs). This network purchases the coins in bulk from the US Mint, then resells them to the public for a small premium above the current spot price of the silver contained within them. 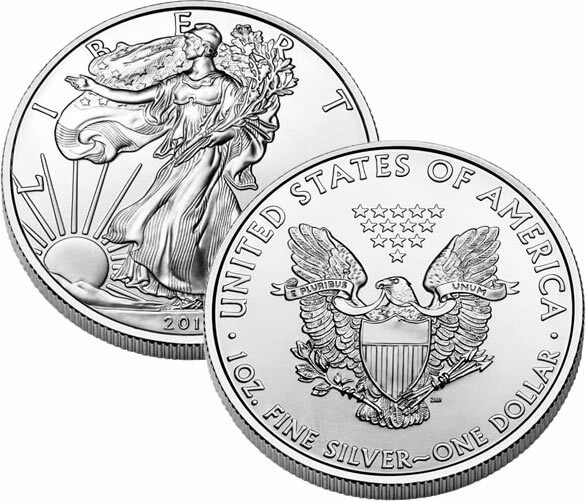 The obverse of each 2013 American Silver Eagle Bullion Coin contains the same design as featured on all other coins of the series since their debut in 1986. It was originally featured on the 1916-1947 Walking Liberty Half Dollar and was designed by Adolph A. Weinman. The Walking Liberty image is considered one of the most beautiful ever struck on an American coin. Obverse inscriptions include LIBERTY, IN GOD WE TRUST and the year. Shown on the reverse of the Silver Eagle is a design by US Mint Chief Engraver John Mercanti. The design showcases a heraldic eagle with shield and the inscriptions of E PLURIBUS UNUM, UNITED STATES OF AMERICA, 1 OZ. FINE SILVER and ONE DOLLAR. Tens of millions of the bullion Eagles are typically struck annually for purchase. Up-to-date sales information on the series can be found on the silver coins sales figures page. Melt values based on the current market for silver is also shown.